For all the newest 182 W Lake Chicago Loop condos available for sale and real estate listings in Chicago, view below! Century Tower is a condo building located in Chicago, Illinois that offers a wide variety of amenities to fit any lifestyle. Search 182 W Lake condos for sale & real estate in 182 W Lake below. Browse our Chicago condos, lofts, Chicago penthouses and Chicago highrise condos for sale by location, size or price and let this website be your local real estate guide. We would love to be your Chicago real estate agents and assist in the condo buying process. To learn more about condos available in 182 W Lake or to schedule a private showing, contact your local Chicago Loop real estate experts today. Read more about 182 W Lake real estate. Interested in buying or selling a condo at 182 W Lake? Call Guarnero Group Compass at 312-810-6693, your local real estate team. Your neighborhood 182 W Lake real estate agents and agents are here to help you navigate the ins and outs of the Chicago Loop condominium market. Located just off the Chicago River at 182 W Lake, Century Tower stands squarely in the heart of Chicago's dynamic Loop neighborhood. Originally completed in 1930, this Art Deco gem has held a prominent place in Chicago's skyline for nearly a century. This impressive vintage beauty is distinct in a number of ways. Not only does Century Tower display a unique, stylized corn cob at its pinnacle, but its unusual colored bricks are also singular features. The bricks of the upper levels have an orange color that, at first glance, appears normal to the eye until they are compared to their limestone and granite-clad brothers. In 2004, lights were added to the upper levels to cast a glow upon the building's stunning architectural details come nightfall. The remainder of the building is covered with unusual purple bricks which rise above four stories of limestone. At the time of its completion, Century Tower was the tallest reinforced concrete building in the world and is presently listed on the National Register of Historic Places. In addition to their exquisite craftsmanship and unique architectural attributes, 182 W Lake condos in Chicago have an interesting history, one which is firmly rooted in the banking industry. In fact, Century Tower was initially constructed as the headquarters of a mid-sized bank called the Trustee System. This bank went under during the stock market crash and riots were held in front of Century Tower as penniless investors fought desperately to get their money back. Today, stone panels on what was once the main banking entrance are reminders of the building's colorful past. They display historic themes and phrases like, "With gold, commerce was carried across the sea." Decorative grille work depicting lumberjacks can also be found on the property's exterior. Interestingly, from 1930-1933, there was a speakeasy on the 23rd floor called the Skyline Restaurant. There was also dancing and live bands on the roof of the building, underneath the penthouse. Today, that area is a shared skydeck for residents. The residential condominiums at Century Tower are stylish, comfortable and luxurious. The wonderfully ornate detailing that was part and parcel of the Art Deco era runs throughout the building, imbuing the property with elegance and its own unique flare. Rich and exotic designs, textures and colors are also common. A variety of floor plans cater to a range of needs. Soaring, 9' ceilings enlarge bright soft-loft style living spaces. Contemporary kitchens have European-style cabinetry and GE appliances. Some units have private terraces but all units boast stunning city views. Building amenities include a gorgeous and expansive landscaped rooftop garden and terrace that offers pretty river views, on-site dry cleaner and valet services and a 24-hour doorman for the convenience of residents. Additionally, maid and concierge services are available upon request. Century Tower's location can't be beat. Less than a half block from the river and Michigan Avenue alike, residents can enjoy a stroll along the river and world-class shopping with complete ease. 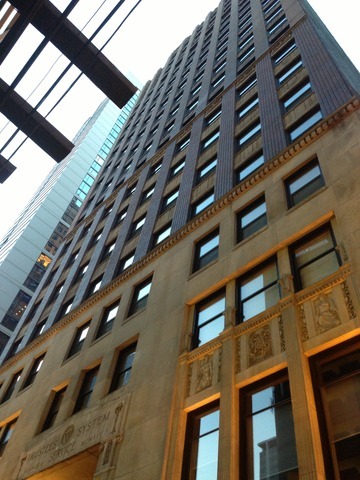 Century Tower is also just a five-minute walk from Millennium and Grant Park's, as well as Lake Michigan. Plenty of fantastic restaurant and nightlife choices fill the surrounding streets and also spill over into the neighborhood just across the river, River North. Chicago's Theater District is a two-minute walk and public transportation options abound. If you're buying or selling a condo at 182 W Lake, let our team of Chicago Loop real estate agents guide you through the buying or selling process today. As local Century Tower real estate agents and real estate agents, we have exclusive insider knowledge of Chicago IL market dynamics. Let us help you today! To learn more about agent representation while buying or selling your 182 W Lake condo, contact Guarnero Group Compass. Check out our comparative market analysis page to receive a free property evaluation in Century Tower. We'll get to work for you today!